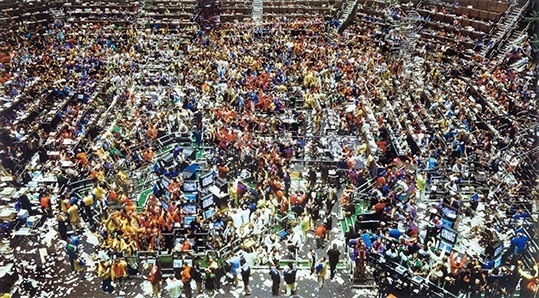 Chicago, Board of Trade II by German artist Andreas Gursky (b. 1955) forms part of the City Self exhibition (29 November 2013 - 13 April 2014) at the Museum of Contemporary Art Chicago. Shot from above, the trading floor is packed with groups of brokers in colourful jackets. Gursky double exposes a few segments of the image to enhance the sense of movement. His use of digital technology does not intend to create fictional narratives but rather to heighten the image of something that exists in the real world.